Journal Reference: Dolan B, B Fuchs, S Rutledge, E Barnes, and E Thompson. 2018. "Primary modes of global drop-size distributions." Journal of the Atmospheric Sciences, 75(5), 10.1175/JAS-D-17-0242.1. Conceptual model illustrating the dominant mechanisms for the six groups objectively determined from surface disdrometers using PCA as a function of median drop diameter (D0) and normalized intercept parameter (Nw). The grey dots represent every point in the global data set. Solid contours represent smoothed Gaussian 1- regions encompassing each of the six groups, determined using thresholds on the principal components, while inferred processes are in black. Statistical analysis performed on a global data set of disdrometer-observed rain drop size distributions reveals consistent modes of variability, independent of location. Data were clustered based on similar characteristics of the drop size distributions, revealing six main groups that were linked to cloud processes and types. These results improve our physical understanding of how microphysical processes impact surface rainfall, and provide new information regarding the global variability of rain cloud type (e.g., warm rain, ice-based precipitation, etc.). These results can be used to improve model representation of precipitation processes and remote-sensing retrievals of rainfall. Twelve disdrometer data sets across three latitude bands are analyzed in this study, spanning a broad range of precipitation regimes: light rain, orographic, deep convective, organized mid-latitude, and tropical oceanic. Principal component analysis (PCA) is used to reveal comprehensive modes of global drop size distribution (DSD) spatial and temporal variability. Although the locations contain different distributions of individual DSD parameters, all locations are found to have the same modes of variability. Based on PCA, six groups of points with unique DSD characteristics emerge. The physical processes that underpin these groups are revealed through supporting radar observations. These groups are consistent with different types of convection: weak, ice-dominated, and robust warm rain/collision-coalescence; and stratiform processes governed by vapor deposition and aggregation. The low latitudes are found to have more frequent robust warm rain/collision-coalescence, while the mid-latitudes have a larger component of ice-based convection. 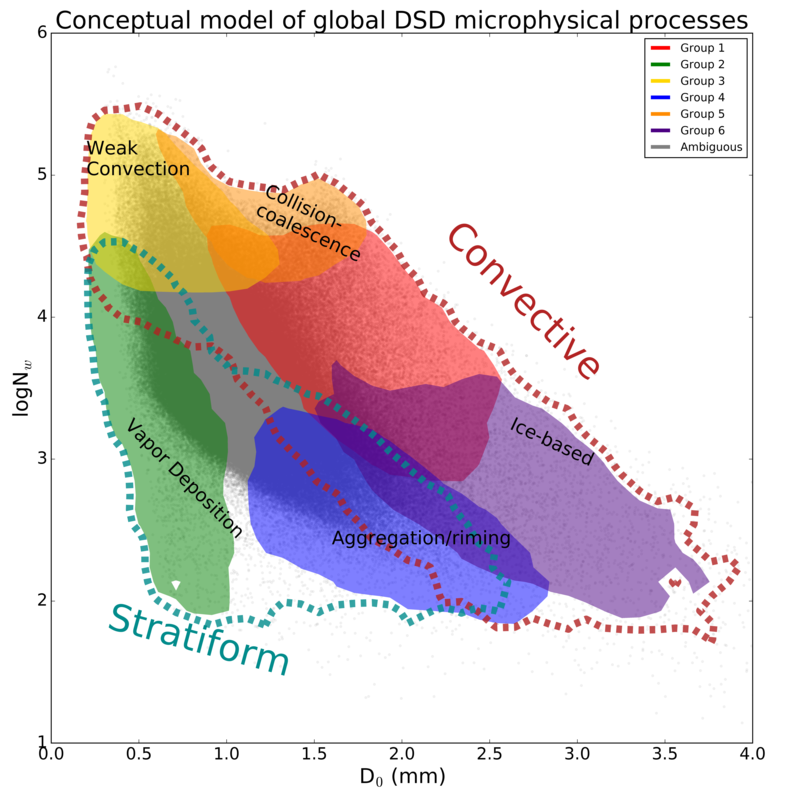 Although all locations exhibit the same co-variance of parameters associated with these groups, it is likely that the physical processes responsible for shaping the DSDs vary as a function of location. This is a subject of future study, as is linking the modes of variability to environmental parameters.